LIZZIE ARNOT announced her arrival at Manchester United this summer in the perfect way – with the first-ever competitive goal for the reformed women’s team. Now, she hopes to keep the feelgood factor going at international level as she bids to help keep Scotland’s World Cup dreams on track. Arnot, along with team-mate Kirsty Smith, left Hibernian in June to join United’s first women’s team in 13 years in a move that sees the 22-year-old go full-time for the first time in her career. She made an instant impression south of the border with the late winner in their maiden outing earlier this month to earn the Red Devils a 1-0 win over Liverpool in the Continental Tyres Cup. And the attacker – who missed Euro 2017 because of a cruciate knee ligament injury that kept her out of action for a year – is now eager to be involved in another career high as Scotland chase the two-goal win over Switzerland they need to keep automatic qualification alive for next year’s finals in France. Asked how it felt to have entered the history books with Manchester United’s first goal, she said modestly: “It’s nice to get on the score-sheet and it was obviously a big game, but it was just important that we tried to win it and it was lucky I was there in the right place at the right time. “It’s just great to be a part of a moment like that, but the main thing was we won, which was good. “For me, it was just like another game and I just try to contribute where I can. Pushing on means Thursday’s encounter with Group 2 leaders Switzerland at The Simple Digital Arena in Paisley. And Arnot admits she will go into the key match on the back of a whirlwind spell since making the switch south of the border. She added: “It’s amazing. I still feel like I’m in a bubble down there. It’s just go, go, go, but that’s good, that’s what you want when you’re down there. “There’s no time really to think, it’s just about football, and it’s great. Switzerland came out on top 1-0 in the meeting between the sides back in April and sit three points clear at the top of the group with just two games each left to play. 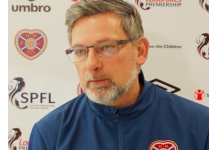 But Arnot is confident the Scots – who kept their hopes on track with an incredible 3-2 win over Poland in June, despite being two goals down – can get the result they crave. With a final qualifier away to Albania next Tuesday, she went on: “It’s obviously really exciting to be part of it. I’m really looking forward to it. It’s a chance for us to try to qualify, which is obviously massive, and we’re feeling good.